Black-bellied Whistling Duck as seen from bench # 7 on the West Pond. Another terrific day in the field and another rarity at Jamaica Bay Wildlife Refuge Queens NY. 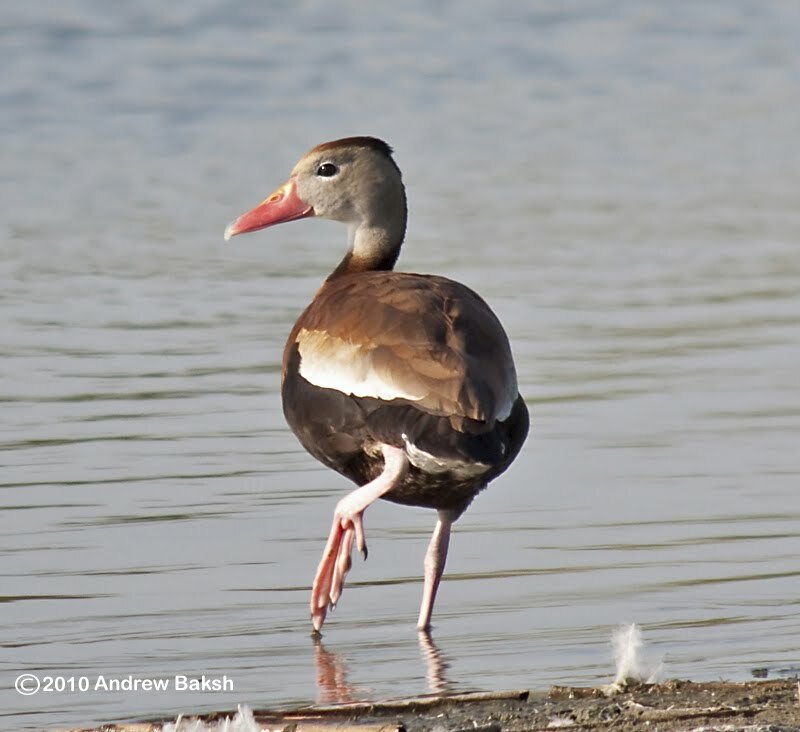 This one, was a Black-bellied Whistling Duck (Dendrocygna autumnalis)found by birders Isabel Conte and Ann Lazarus this afternoon on the West Pond around bench number 7. 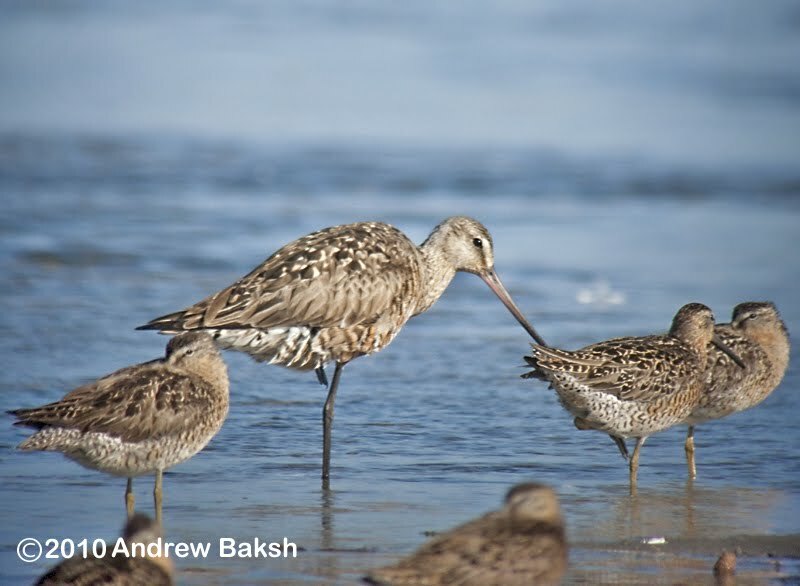 Many birders responded to the alert and phone calls that went out. 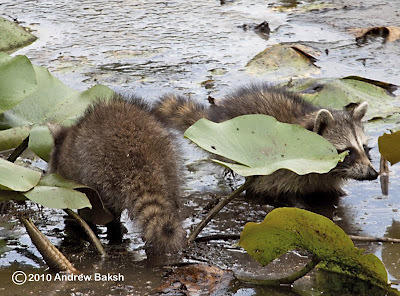 I received my call from my friend Shai Mitra while I was all the way down at the North East end of the East Pond and so did the schlep back over to the West Pond. 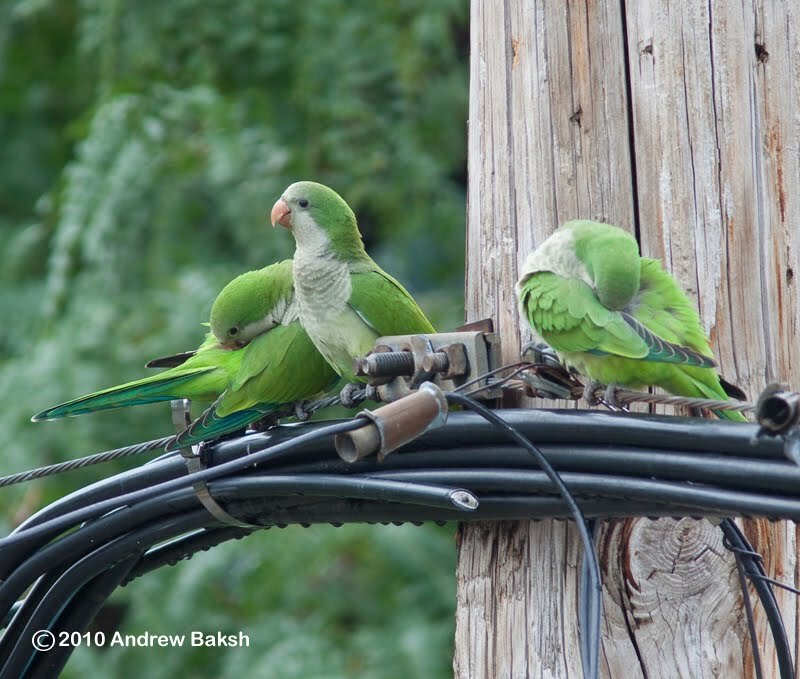 Thankfully, the bird was there and was still loafing around when I departed around 6:45 p.m. 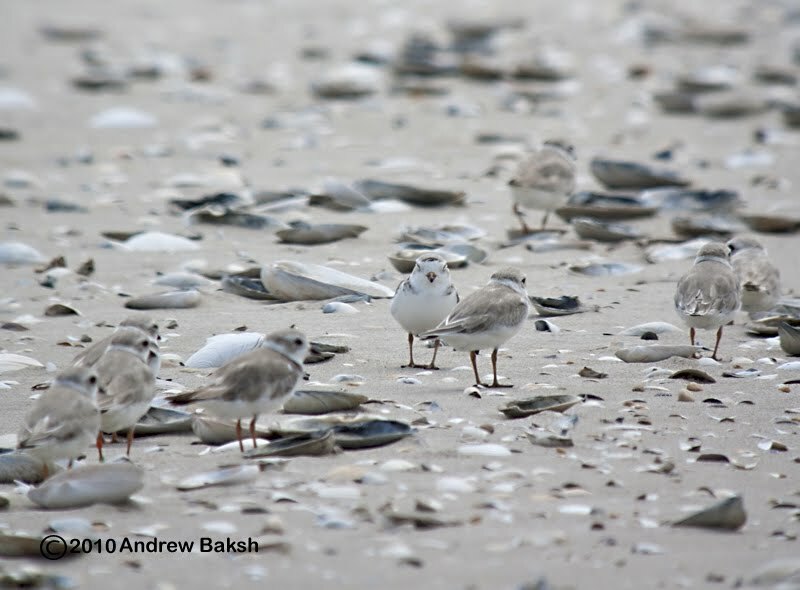 The bird had moved over further to the right of bench number 6 after being harassed by a Great-Black-backed Gull. During the observation of this duck by the many birders the discussion on hind toes came up and so I tried to get good photos of the toes for documentation. (Updated 8-2-2010) When I published this post on Saturday, I did not elaborate on my comments on the "Hind Toes"...here is a bit more on why the toes were important. 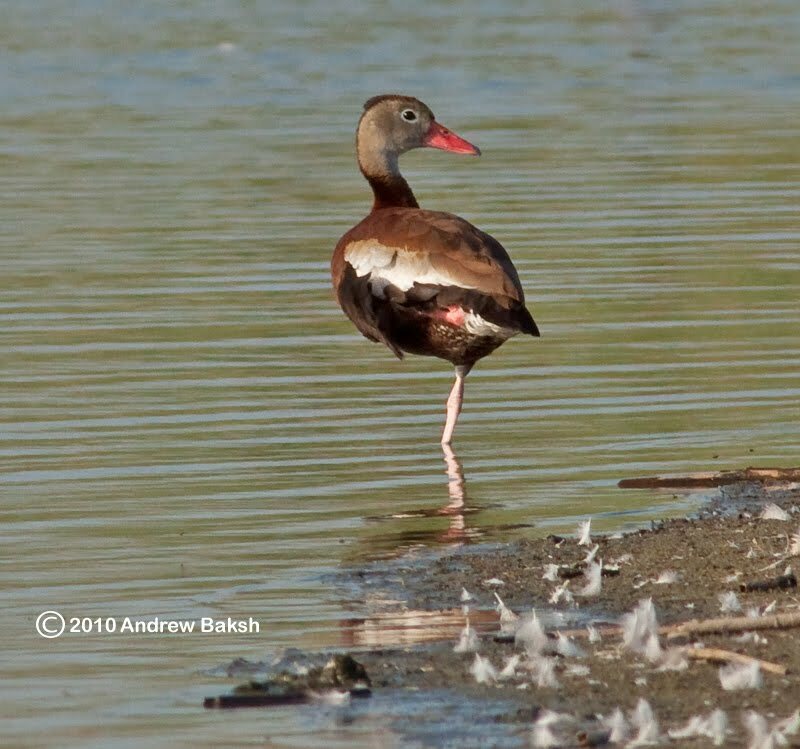 What I gathered from the more experienced birders that day, is that farmers or collectors sometimes clip the toes and or clip the wings of ducks like these. 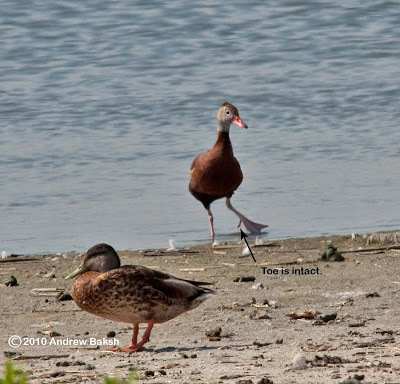 Having the toes intact is just one way of determining if the duck was domesticated or wild. 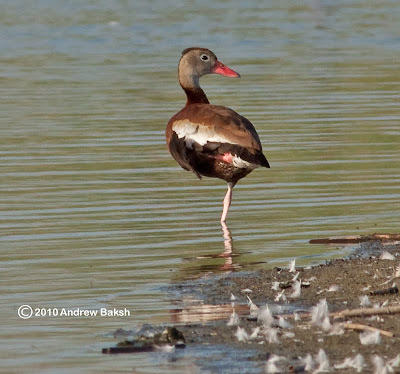 With this duck, the toes were intact and the wings did not appear to be clipped. 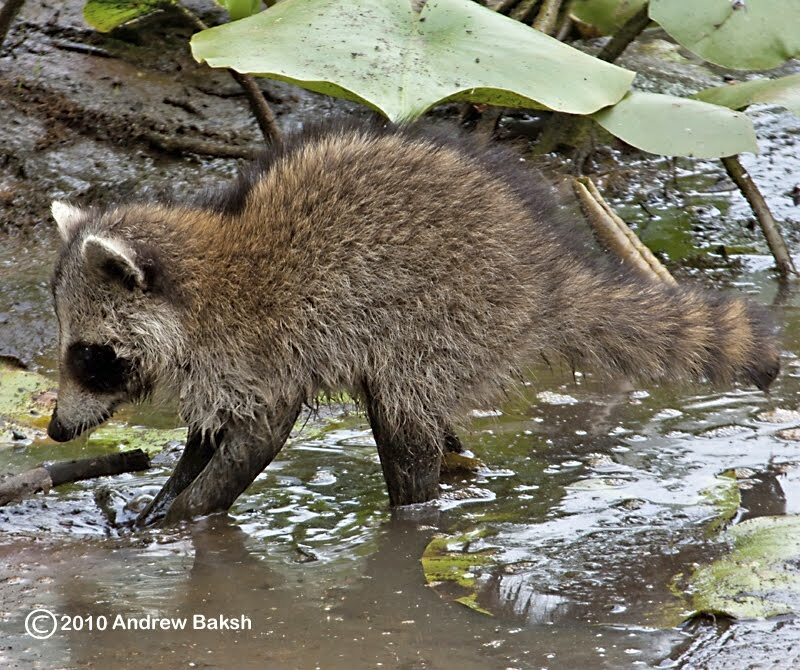 All positives for when the discussion on whether to accept this as a rare and legitimate sighting takes place. If accepted, this would only be the second record for NY state, with the 1st occurrence (also pending acceptance) taking place earlier this year in Brewerton NY. Here are some photos from this afternoon. Note that the hind toe is intact on this bird. Black-bellied Whistling Duck at Jamaica Bay Wildlife Refuge. Knowing that I wanted to photograph the hind toe, the BBWD obliged. 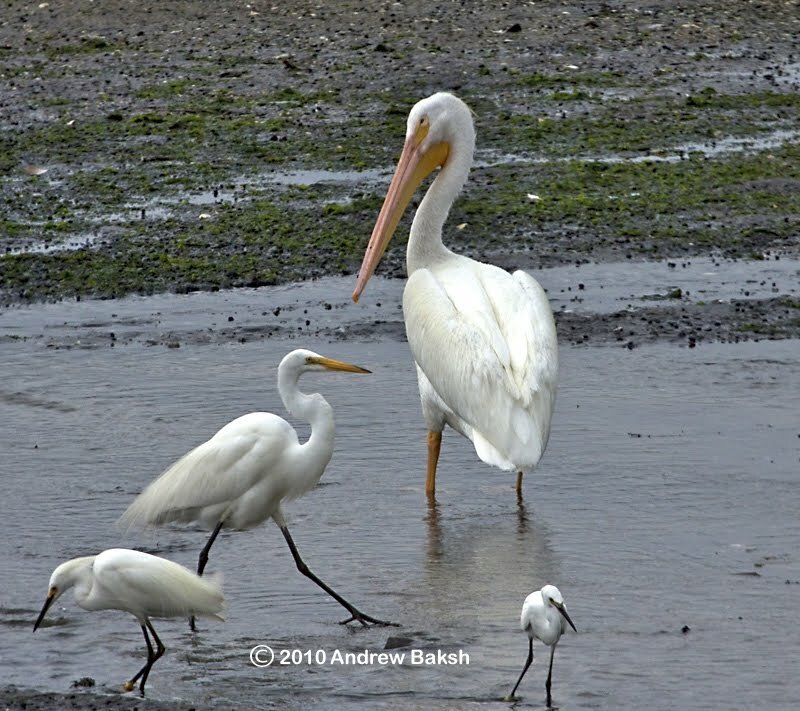 Some of the BBWD observers on the West Pond. Short-billed Dowitchers on the East Pond at Jamaica Bay Wildlife Refuge. 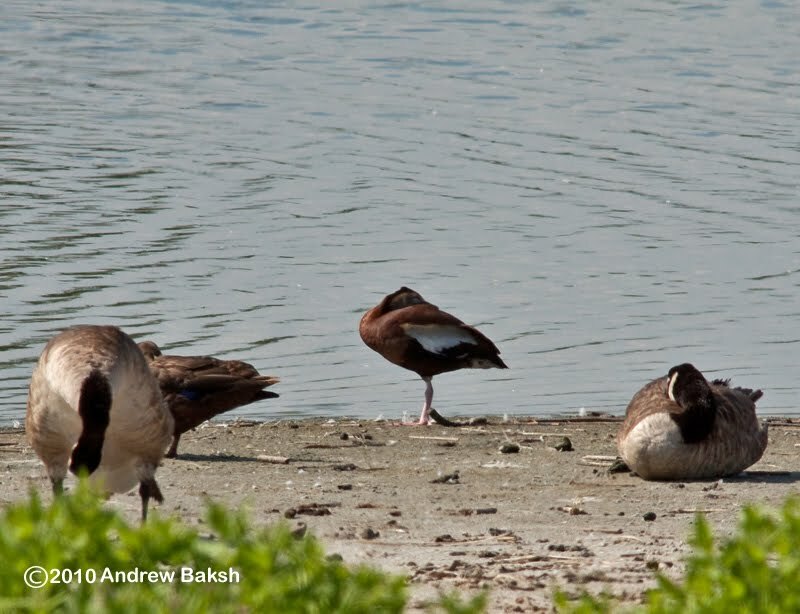 I had an early start at Jamaica Bay Wildlife Refuge on the 24th, where I ran into Brooklyn birder Shane Blodgett. Together, we birded the East Pond and had 14 species of Shorebirds. The following are conservative numbers of what we came up with. 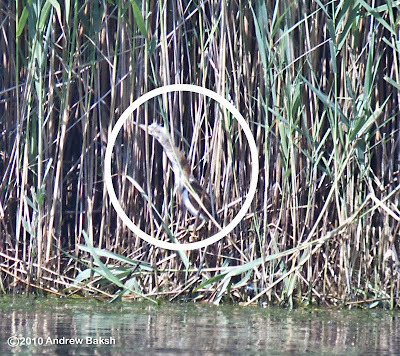 Juvenile Least Bittern digiscoped from a distance. Friends, Shai Mitra and Patricia Lindsay arrived while we were out on the pond and in no time they picked up 2 Least Bitterns. One Adult and one juvenile. 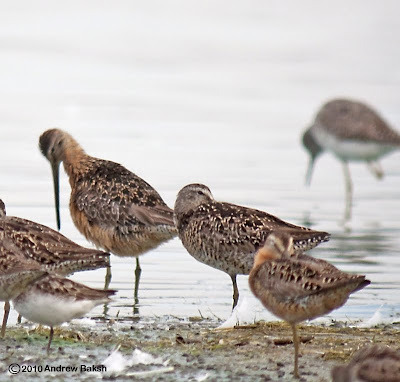 They also had a Long-billed Dowitcher. Shane and I had debated over on LBDO candidate, but let it go because we were not sold on the field marks. 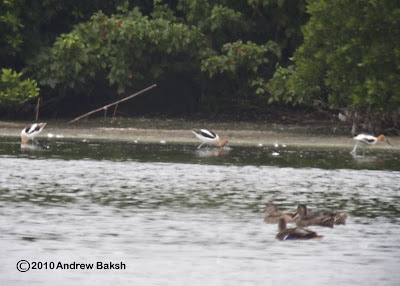 Western Sandpiper with a rather small bill. Later in the afternoon, I joined Shai, Pat, Joan and Gerta out on Eastern Long Island where we birded Cupsogue. We tried for a Brown Pelican that was seen earlier in the day, but it was not at the said location. 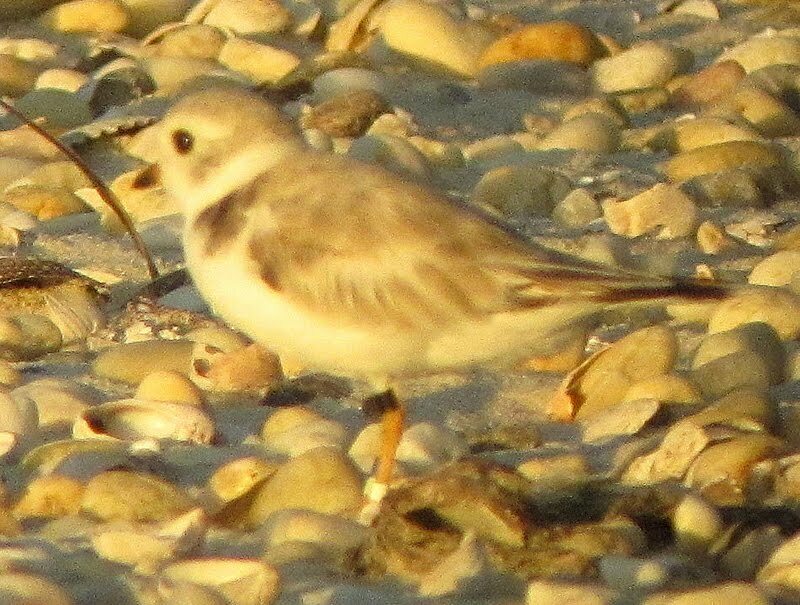 Out on the flats, our highlights were Royal Terns, we had 9 out on Pikes Beach earlier, a tiny billed Western Sandpiper and 1 Pectoral Sandpiper, a good shorebird to get at that location. 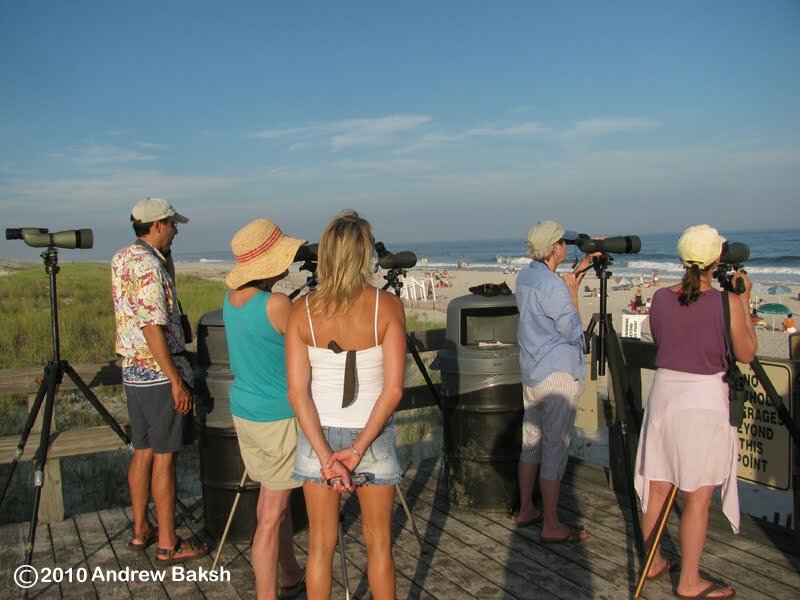 Sea watching with the gang. Good Times out at Cupsogue LI. 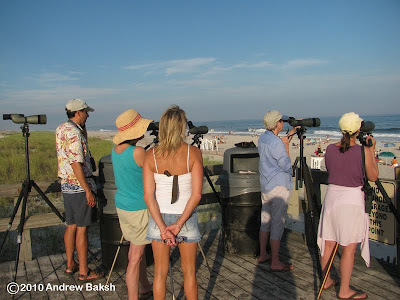 A seawatch after Margaritas produced Greater Shearwater, Whimbrel, Northern Gannets and lots of migrating shorebirds. 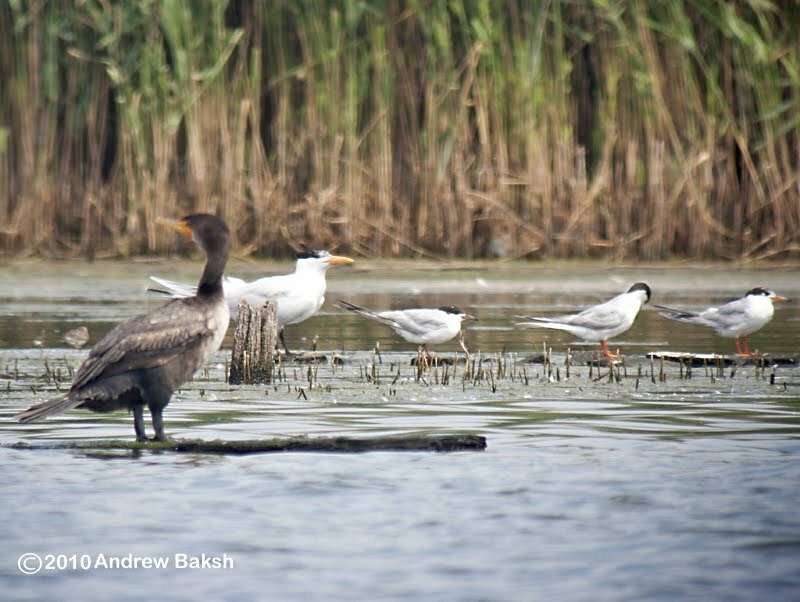 Yesterday, after doing a stint on the West and East Ponds at Jamaica Bay Wildlife Refuge, I headed out to Breezy Point for some volunteer work. 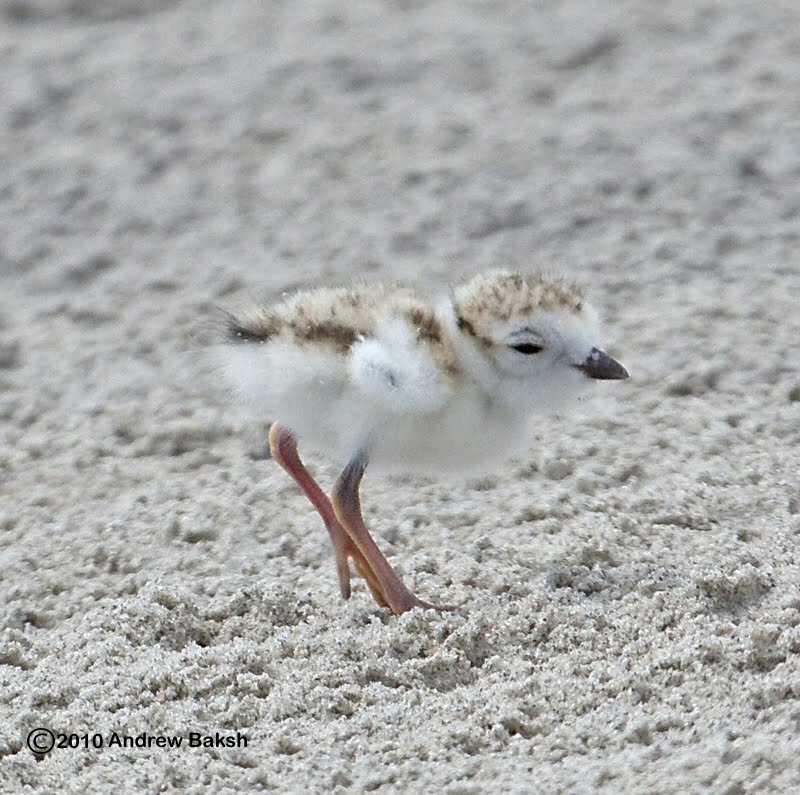 Readers will remember, last summer I had Piping Plover nest duties and this year I have done some of the same. It was a good Plover day as I counted 47 Piping Plovers (Charadrius melodus). 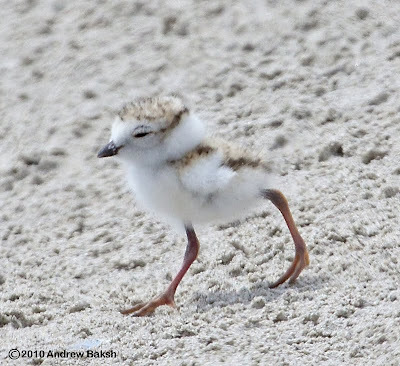 More exciting though was the sighting of 2 banded Piping Plovers whose band colors were consistent with those used on Plovers that were banded in the Bahamas. This afternoon Peter Doherty and Dr. Cheri Gratto-Trevor who are directly involved with the initiative, confirmed that the two birds I reported were indeed banded in the Bahamas. 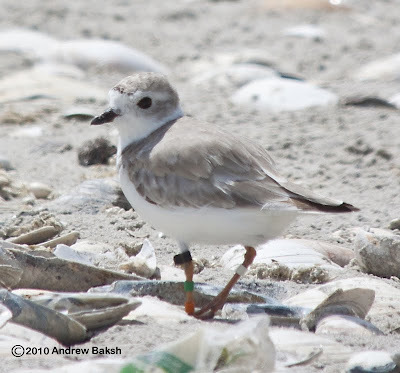 I learned that Bird # 1 was banded by Sid Maddock and Peter Doherty for this project at South Blanket Sound Flats, North Andros Island, The Bahamas, on 14 Feb 2010. Bird # 2 was also banded by Sid and Peter on February 10th, at the same location as the one above. 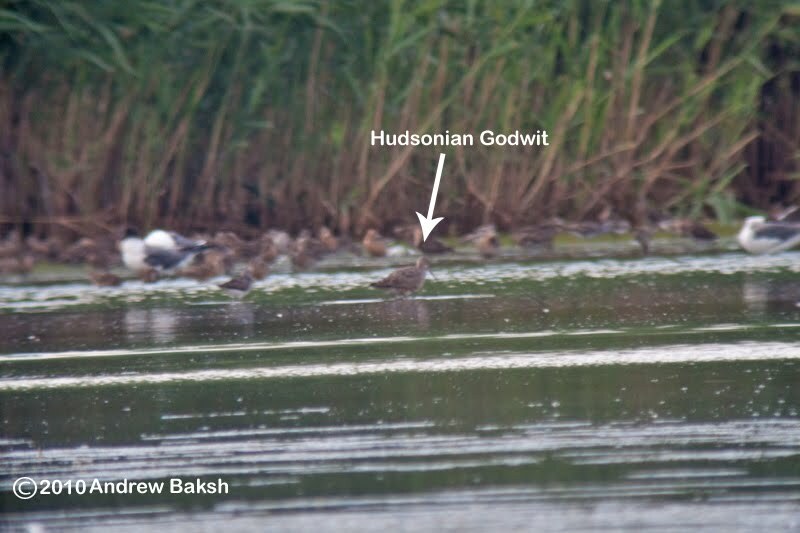 It appears Bird # 2 has been at Breezy Point for a bit as, it was reported on the 26th of June by Brooklyn Birders Heydi Lopes and Rob Jett. 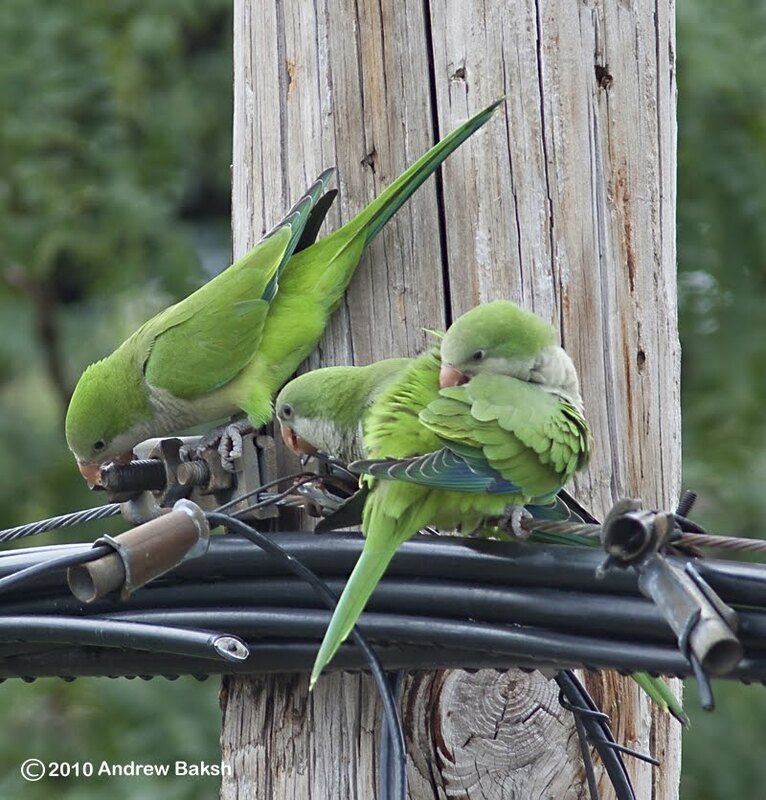 Bird # 1, well…there is some uncertainity on previous sightings due to documentation, but it could have been seen as far North, as Newfoundland. With these 2 birds we now have records of three sightings at Breezy Point (thrilling stuff for the Piping Plover team at Breezy). In the spring, Piping Plover volunteer Avi had the first Breezy Point sighting of a Piping Plover banded in the Bahamas. 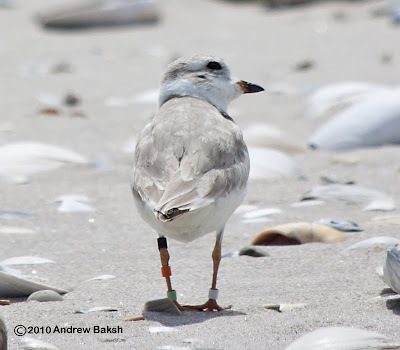 To date, I believe we have reports of 38 re-sightings of the 57 banded and # 39 may have been recorded today. 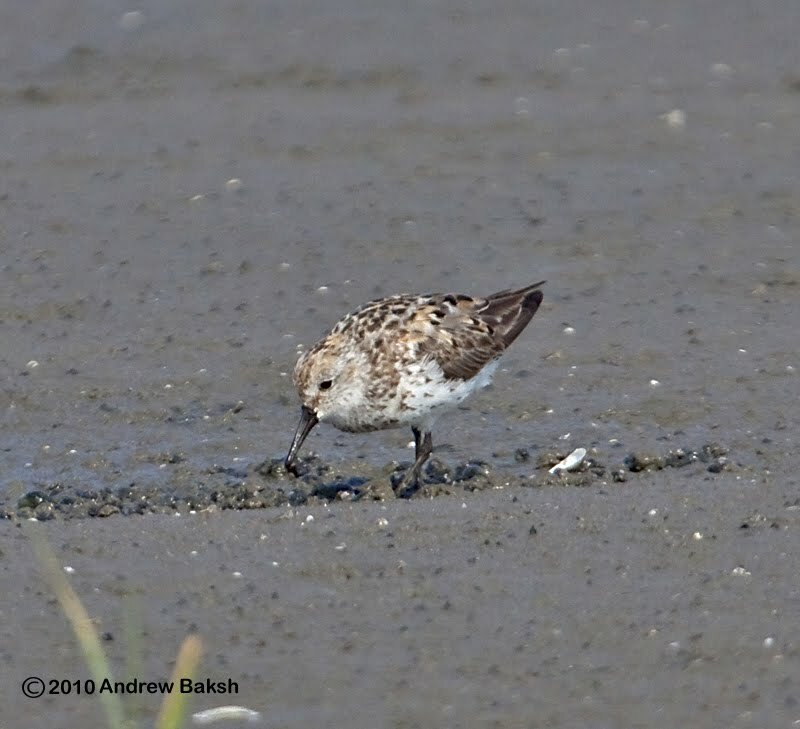 Birder Shane Blodgett found one today somewhere out on LI and called me this evening about his sighting (I have published one of his photos below). I am sure once verification is confirmed on Shane’s bird, Peter will post an update. Shane's find, if new could bring NY sightings to 13, one behind MA, where 14 sightings have been recorded. 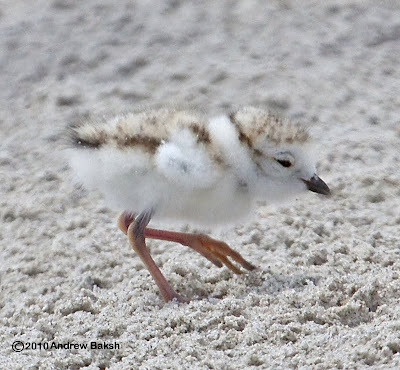 More Bahamas banded Piping Plovers are being re-sighted each day. Each observer who has made a re-sight has been thrilled with their discovery (Just like I was). Birders, plover monitors and beach walkers should remain alert for Bahamas plovers and to report their sightings as explained here. A discussion on who will do the dangerous task. Looks like someone got their assignment. Heard these guys minutes ago in the backyard, they then flew to the power lines where I was able to snap off a few shots. Monk Parakeets, have adjusted quite well in New York City and could possibly be in all five boroughs. 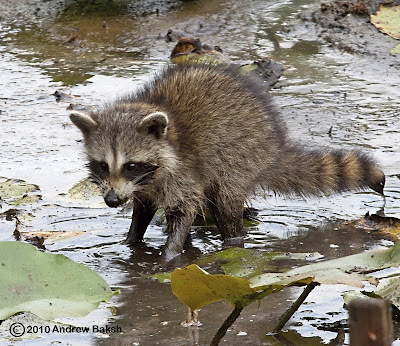 There was a colony not too far from where I live, but their nest seemed empty when I checked in the spring and appeared abandoned. Maybe, they are scouting real estate in the neighborhood to set up shop again? 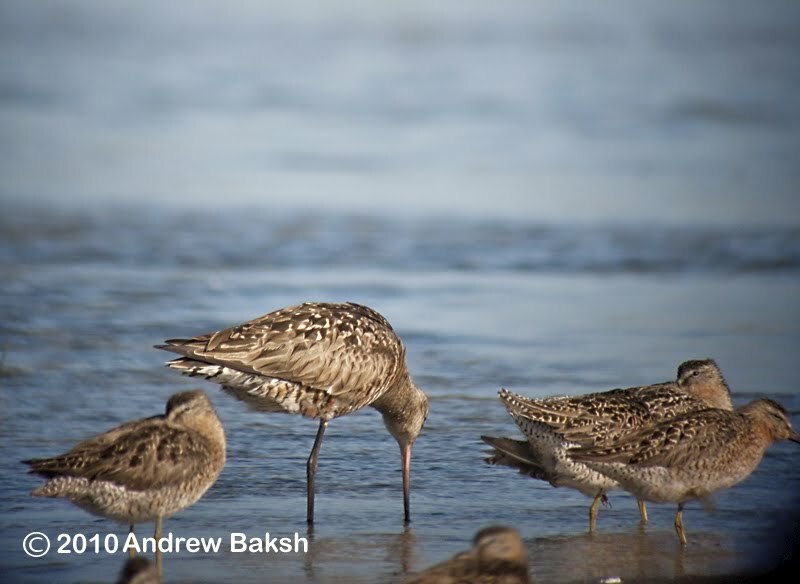 After reporting the American Avocets and American White Pelican on the 15th of July at Jamaica Bay Wildlife Refuge, the very next day a Hudsonian Godwit was found by birder Tom Fiore. 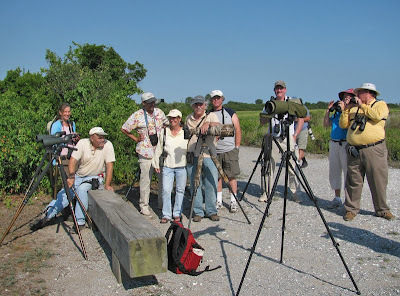 That day, to my knowledge only 3 of us got to see that bird, Tom, Bobby Kurtz and I. No one, was able to relocate that bird in the afternoon and throughout the weekend, no one reported seeing it. 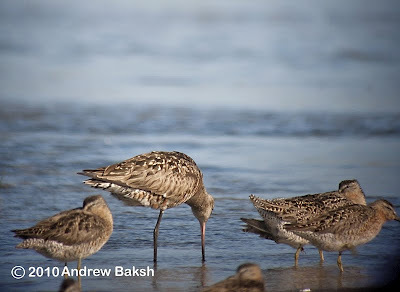 On Monday July 19th, I found a Hudsonian Godwit around Sanderling Point on the East Pond at Jamaica Bay. 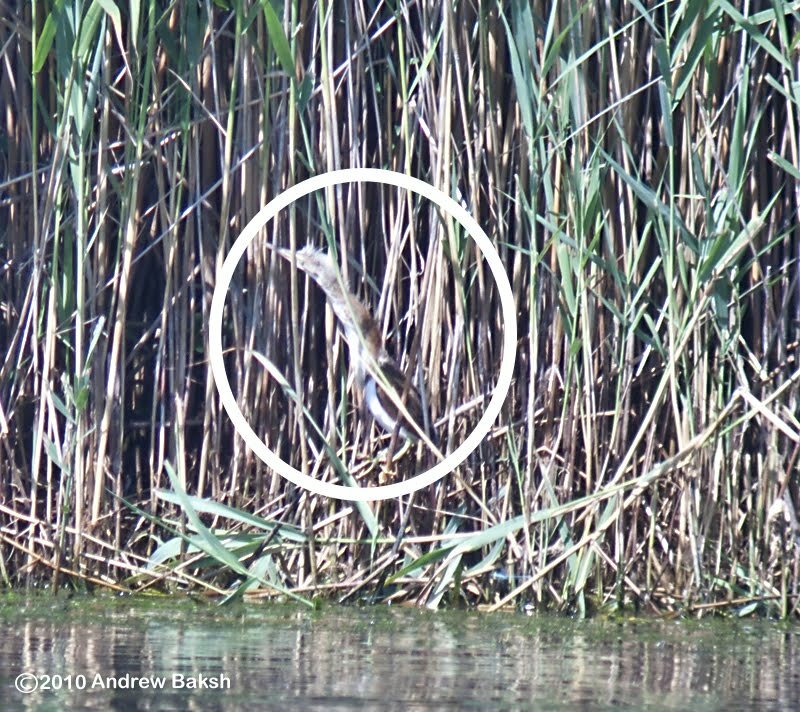 This could very well be the same bird that Tom had found last week or an entirely different bird. 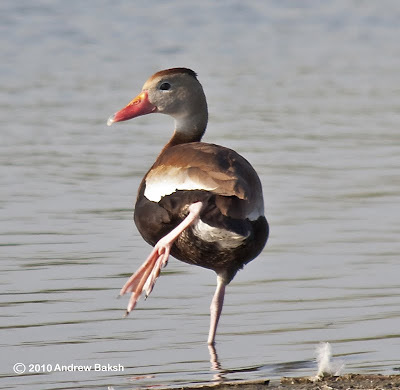 The bird seemed to like the area around Sanderling Point on the pond and that made for very difficult views. However, I was able to pick it up from the North End and as well as from the Overlook at Big John’s Pond trail, which is down the South End. 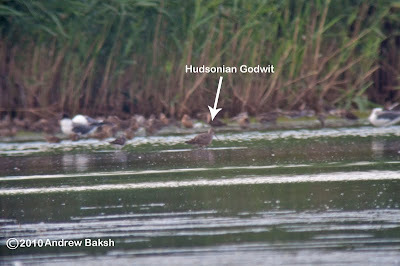 Both looks were distant and with shimmer it made spotting quite difficult. 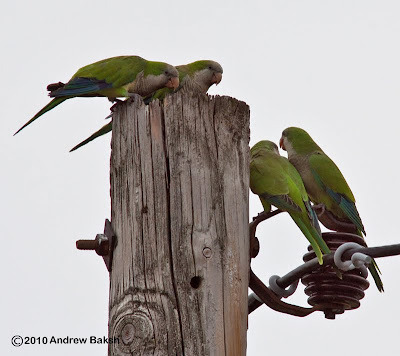 However, if the light is just right, one could get decent looks of the bird; this was the case on Tuesday as birders Stella Miller and Sam Janazzo were able to get on the bird from the Overlook in overcast conditions. 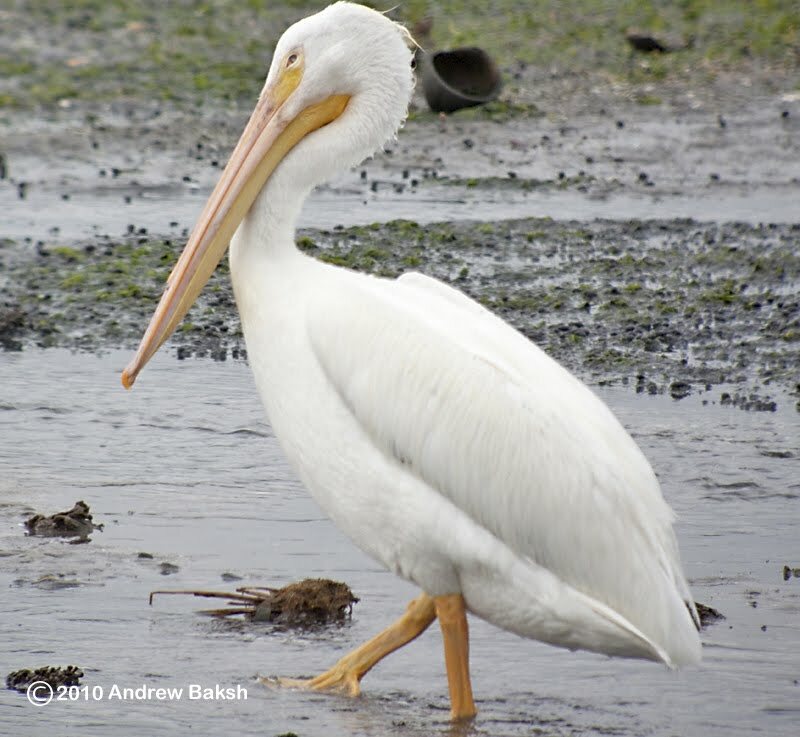 Yesterday, I walked in from the North End of the East Pond up to the infamous cove and saw the bird again. 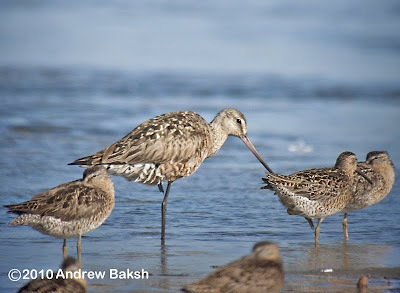 In addition, to the Godwit, additional shorebirds are also steadily arriving. 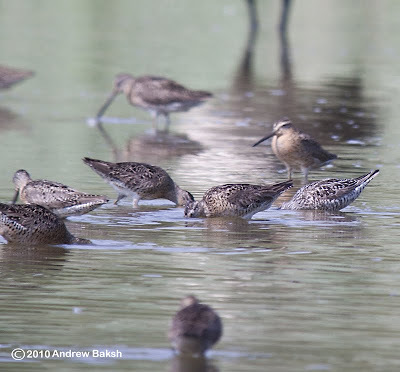 Sightings of Pectoral Sandpipers, Western Sandpipers, and Stilt Sandpipers add to the now ubiquitous sightings of Least Sandpipers, Semipalmated Sandpipers, Semipalmated Plovers, Killdeers, Spotted Sandpipers, Shortbilled Dowitchers and Greater and Lesser Yellowlegs. 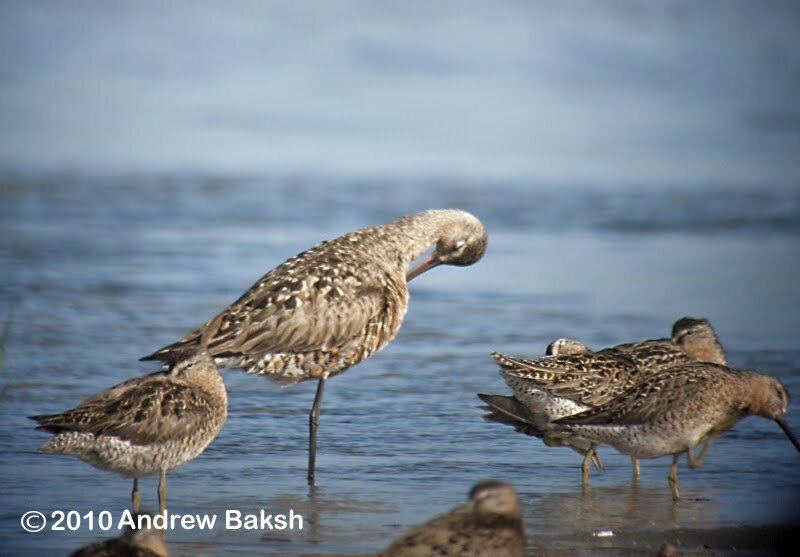 Interesting and sometimes unusual occurrences continue with flyovers of an American Bald Eagle, Whimbrel and Black Tern. 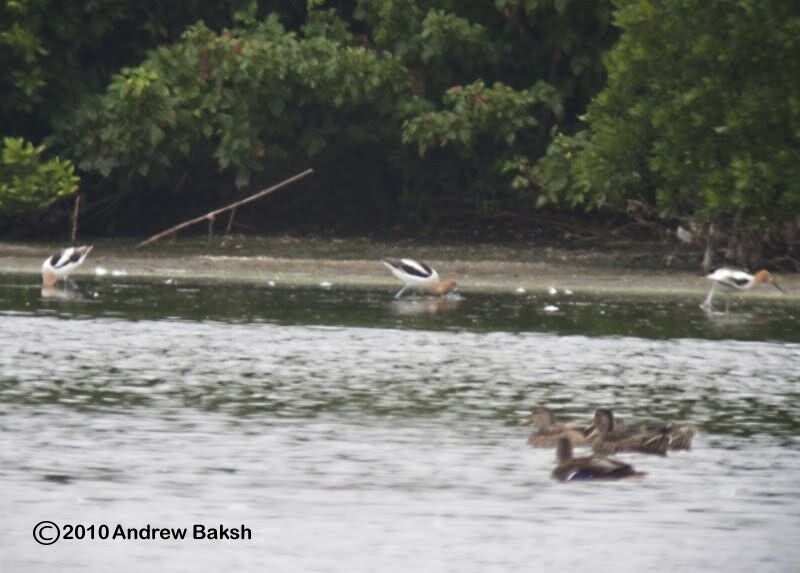 Taking a gamble that I could get in some birding before the thunderstorms hit the area, I birded Jamaica Bay Wildlife Refuge starting on the West Pond and ending on the East Pond. I ended with a 75 day species list that included 15 species of shorebirds. 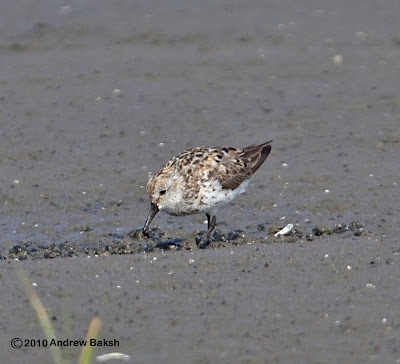 Shorebird highlights included Western Sandpiper (1), Stilt Sandpipers (7), Pectoral Sandpiper (1) and American Avocets (3). American White Pelican at Jamaica Bay Wildlife Refuge. As if that was not enough for a good day in the field. 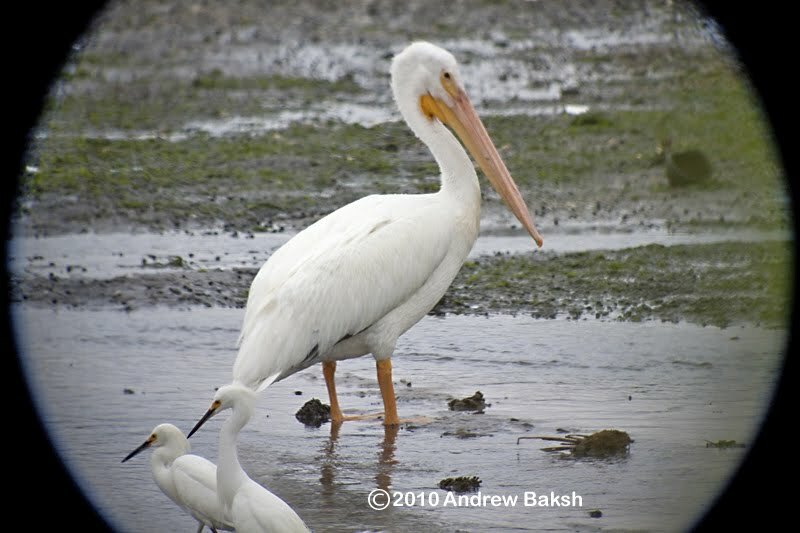 National Park Service Rangers, Julia Clebsch and Neena Mohammed found an American White Pelican (Pelecanus erythrorhynchos) while on assignment at the North Channel Bridge. The rangers were there for a Turtle release and to monitor the valve where water, is flowing from the East Pond as part of the water level lowering. 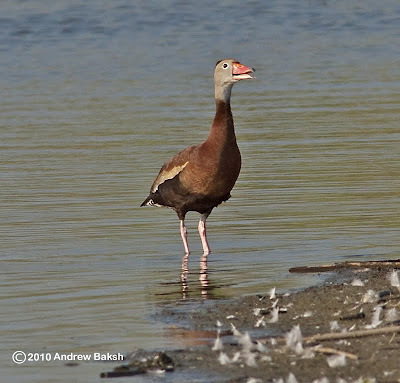 Talk about being in the right place at the right time - I joined Julia and Neena and was able to observe and photograph the bird.